4 different Hanging bell rattles, each are colorful and differ in shapes. The rattles are music themed, Each rattle is unique and fun to play with. Your baby will love playing with so many rattle toys! It makes soft sound when you shaking,you babies will be attracted by it.The BB-device help to stimulate your babies muscle and delevop grab ability.  TAKE THE FUN WITH BABY: Stroller toy with a balance between bright color,cute animal,high contrast patterns and rattle sound that help stimulate baby's abilities.Baby can learn colors name and animal while playing. They will happy to play with this cute friends. 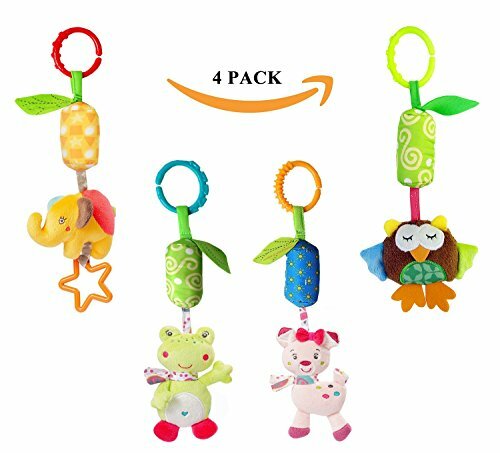  SOFT VOICE TO ATTRACT BABY: Each car seat hanging toy built-in wind chime and BB-device.It will make soft sound to attract your baby when shaking,help parents to play with babies.Sweet animal comes with BB-device,gently press and it will squeak.  SAFETY FRIENDLY MATERIAL: Toys with safety and non-toxic material,no harm for babies. You can hang it around bed or car seat with the clasp, very easy to hang or take down.Also allows the baby holding a toy to play,training baby's hand-eyes coordination.  GREAT BABY GIFT: Parents always want to give best to children. Leedemore stroller toy is one of the best. Our toys made of safety and healthy material. Parents can use it as a gift to baby in their baby shower,birthday and so on.  WARRANTY: 100% money back if you are not satisfied with our product. All we want to offer is a happy childhood and Good parent-child relationship for your baby as well as family. If you have any questions about this product by Leedemore, contact us by completing and submitting the form below. If you are looking for a specif part number, please include it with your message.